A cursed book. A missing professor. Some nefarious men in gray suits. And a dreamworld called the Troposphere? 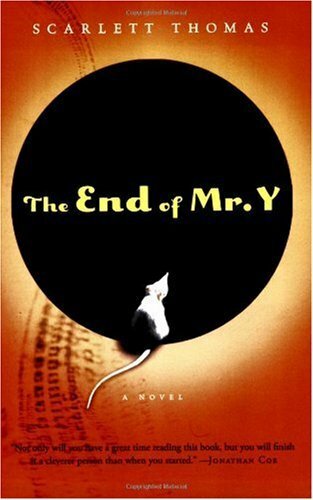 Ariel Manto has a fascination with nineteenth-century scientists- especially Thomas Lumas and The End of Mr. Y, a book no one alive has read. When she mysteriously uncovers a copy at a used bookstore, Ariel is launched into an adventure of science and faith, consciousness and death, space and time, and everything in between. Seeking answers, Ariel follows in Mr. Y's footsteps: She swallows a tincture, stares into a black dot, and is transported into the Troposphere- a wonderland where she can travel through time and space using the thoughts of others. There she begins to understand all the mysteries surrounding the book, herself, and the universe. Or is it all just a hallucination? With The End of Mr. Y, Scarlett Thomas brings us another fast-paced mix of popular culture, love, mystery, and irresistible philosophical adventure.